Your stamina will reward you. This sizzling blend of Panax Ginseng and Coenzyme Q was designed to individual's sexual stamina, performance, and desire. Take 1-4 capsules as needed. 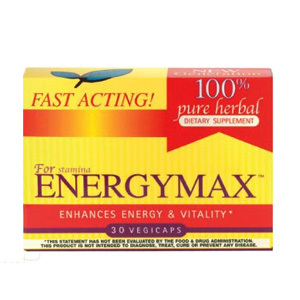 Take Energymax during the daytime. 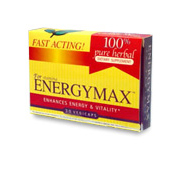 Caution: This product may cause sleeplessness, so do not take Energymax before bedtime. Ingredients: Eleuthero Root B.E.E., Panax ginseng root B.E.E., CoEnzyme Q10, Beta-1, 3 Glucan, Pyridoxine, Folic acid, Cyanocobalamin, Silica, Magnesium stearate, Hydroxypropylmethylcellulose (vegetarian capsule). Energymax - shipped in a discrete, unmarked package. Orders are processed immediately and usually take about 3 to 5 working days to be received. We do ask that you try it for 2 to 3 weeks to feel the full effects. Any information received is used only for order processing and shipping purposes. Your information, such as e-mail address, will never be disclosed to a third party.